Deputy First Minister of Northen Ireland Martin McGuinness speaking on day two of the Sinn Fein Ard Fheis. SINN FÉIN’S MARTIN McGuinness said the law in the north must change to allow termination of pregnancies in traumatic circumstances of fatal foetal abnormalities and sexual crimes. 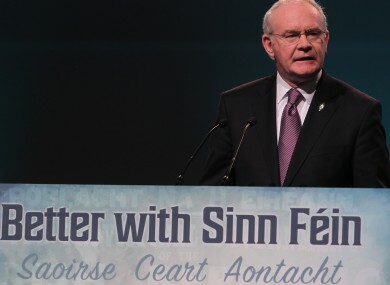 Speaking at this year’s Sinn Fein Ard Fheis at the Dublin Convention Centre, McGuinness said the recent criminalisation of a young woman in the north was “absolutely wrong”. The young woman was given a suspended sentence after buying drugs on the internet to induce a miscarriage after failing to raise enough money to travel to England for a termination. While I would caution against anyone using medication accessed on the internet, women facing difficult personal circumstances as a result of pregnancies must be treated with compassion and sympathy. However, speaking to BBC’s The View, McGuinness confirmed he was not in favour of abortion in all cases. He also told the programme, he was against the use on online abortion pills. A mechanism needs to be found to stop that. Last year, Sinn Fein passed a number of motions allowing for abortion in the case of fatal foetal abnormalities. Delegates also voted last year for the 8th amendment of the Constitution to be repealed. McGuinness also addressed the issue of marriage equality. Sinn Féin is determined to confront and face down sectarianism, bigotry and homophobia. Others also need to accept their responsibility to do the same. They need to catch up with the rest of society. We need to see equality for all our citizens, and that means the immediate extension of marriage equality to every part of this island. Email “McGuinness says criminalisation of woman who took abortion drugs was 'absolutely wrong'”. Feedback on “McGuinness says criminalisation of woman who took abortion drugs was 'absolutely wrong'”.